Jane Austen’s Pride and Prejudice came to mind when I thought about the title of the exhibition. First, because the imagined conversation is an analogy to described the thought processes and combination of techniques and materials between photography and painting. Referring to the wall text, the artist is challenging our understanding of paintings and photography, like Jane Austen’s Pride and Prejudice opening sentence of the novel challenges the readers’ stereotypes of rich, eligible bachelors. To put it in another way, the artist is questioning our perception of the status of painting and photography in the contemporary art arena. From the perspective of the art market, paintings no doubt command higher prices; yet from a technological perspective, photography seems less bound by a flat surface or traditional means, and have moved quite easily with the times. Second, the conversation taking place between painting and photography is captured in free indirect speech, where the artist is the narrator and observer. Indirect speech is essentially a third person narration, used along side first person direct speech or thinking out loud, used by Jane Austen in that novel. Returning to Sarah Choo’s first solo exhibition disILLUSIONed, there are possibly four strands in the works: the pure paintings on canvas, the paintings on inkjet printed canvases, and the digitally manipulated photos on inkjet print, and mounted on aluminum; lastly, the projection on a painting of fabric (or bedsheets). Going along with the analogy used in the title of the exhibition, perhaps these signify the extent of the conversation or monologue by the art form? In the pure paintings, many things are intended and happening on the surface; events are unfolding, yet hidden. Clearly an unusual portraiture (and I’m convinced the artist can paint faces if she wanted to), veiled and masked by what appears to be a pillow case. Willing or unwilling victims, hero-like masked crusaders, or failed villains are possible characterisation the viewer may attach to this diptych. 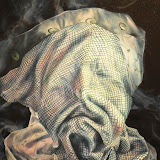 Yet they are depicted in a ghostly manner – the edges of the fabric blends into a wisp of smoke – suggesting they are just conjured, or disappearing. In 2012, we are still observing the Hungry Ghost Festival between 17 August to 15 September, so this may mislead our interpretation of the exhibition. On careful observation, despite the masking, the person underneath the pillow cases could well be the persons featured in another work – the projection on canvas – namely the second and third figures from the left (see images above). Because this diptych takes centre stage in the exhibition, I would assume they are the most important figures in the artist’s life. Extending this observation, it is possible that the other figures are also involved in sitting or posing for the artist. On another level, they may well be other people the artist values, depends on and is supported by strongly. In the photographs, close-ups of skin are turned into an abstraction of muted colours and marks. Bearing the marks of time, or aging, these images remind us of human’s fragility, temporality and mortality. Digressing a little, perhaps the term humility, meaning “having a modest or low view of one’s importance”, is a calibrated, informed response from the perspective of everyone’s mortality. The photographic works hanging in the exhibition, contrast starkly with the ones hanging just outside the entrance of the gallery. These are from a different series. Outside, they resemble some sort of fashion photography that juxtaposes a human figure with a interior or landscape for surrealistic effects. Specifically, I’m intrigued by the potential of the piece Antique Lady (2012), because it embodied one possibility of integrating the subject matter with the technical processes on a deeper, more conceptual level, as well as on a physical level. In that digitally image, the bare back of a lady becomes the ‘canvas’ – not for a tattoo, but a projection of a detail from a painted blue and white porcelain. Rather than a digital juxtaposition, perhaps the painting could be done directly on the canvas, blurring the surface and the scene. While the ‘detail’ will need to be carefully chosen, rather than a direct copy from a blue and white porcelain, this might offer an additional layer for storytelling. What is to be painted, and what is not would need to be considered carefully. Likewise, the extent to which multimedia is used, should this evolve into a full scale installation should be careful thought through. A decision would need to be made if it’s to be deliberately cheesy, like Jay Chou’s music video for Qing Hua Ci (青花瓷) or dead pan seriousness. In the paintings on tiled backgrounds, the poses of the figures possibly reveal the personality and character of their sitters. The lighting is well captured and depicted, and the same disappearing edges of the centre figure is applied. The textured background served more as visual devices to provide a contrast to cloth and flesh, yet we can’t help pulling a connection with the mysterious figures in the foreground. Beyond their decorative purposes, the degradation and deterioration suggests the natural elements (including time) eroding something – pride and prejudice, perhaps? According to the Oxford online dictionary, the word grieve has two meanings. On one hand, it describes a feeling of intense sorrow; on the other hand, it describes an object or scenario that causes great distress to another person. 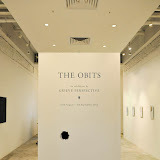 In this light, the artists’ collective, Grieve Perspective, has been consistent to their group name in this deft exhibition; this time dealing with death, morbidity, memory, fiction and storytelling. Like the dodgy taxidermy black Myna bird (Brace, 2012) that appears to have crashed through the exhibition wall, emerging comically on the other end, black humour can be read in the rest of the works. On one gallery wall, six curious newspaper clippings are immortalised as art. Like Joseph Kosuth’s VI Time (Art as Idea as Idea) (1969), the artist’s authorship is masked; just as the authority of the newspaper as carrier of factual truth is called into question here. On closer inspection, they contain obituaries (or ‘obits’ for short), written as a short story or commentary. While not to be taken at face value, they do question the memories left behind after one’s passing: what is re-membered, fictionalised and finally narrated could well be selective facts that form an entirely different story. Recalling British artist Damien Hirst’s famous shark, The Impossibility of Death in the Mind of Someone Living (1991), this series also illustrates our fascination with death. This series also breaks the taboo of talking about the death of someone living. While the characters are no doubt fictitious, as many people share the same names, they do bear uncanny resemblances to characters we might know – bringing out the worst of them – or worst of us. On another wall, a video Singapored (2012) shows scenes of Singapore devastated by a projectile (meteorite or missile) but life simply goes on nonchalantly. In They Make Me Do It (2012), a forearm is cut from an anonymous body, presumably the artist’s, yet still holding a pen and trying to draw or write something. On one hand, read from a discourse theory perspective, the title suggests that the artist is a victim of sorts. A victim of the artworld (as opposed to the underworld), or art market. On the other hand, from a group perspective, the artist’s individual voice is (deliberately) lost in the collective. The idea of an artist collective creates several interesting dilemmas: first, is there is a need to state an artwork’s authorship if claim is non-essential? Second, if a collective means having more ideas, and more working hands, does it necessarily result in a scenario where ‘too many cooks spoil the broth’? Third, in Danto’s concept of the artworld, an artwork relies on many individuals and institutions before it becomes meaningful and important. Where does the collaborative collective start and actually end? Fourth, relating to authorship, who is responsible for an artwork, especially if the work has a social commentary? Or does the shared or diminished responsibility allow the artists to make bolder new works? Do remember to grab the Grieve Perspective manifesto.